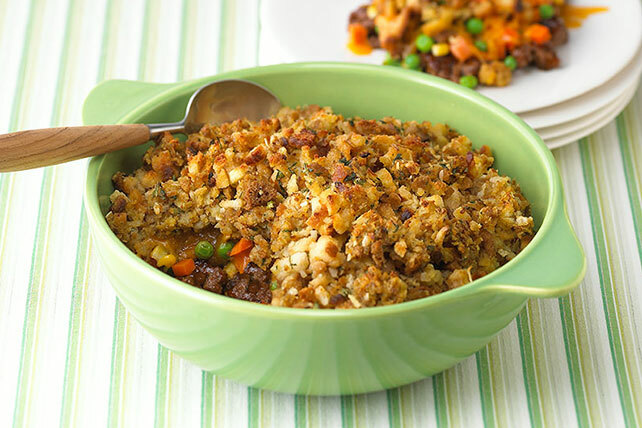 Flavorful STOVE TOP Stuffing replaces mashed potatoes in this simple variation on a classic. Prepare stuffing mix as directed on package. Meanwhile, brown meat in large skillet; drain. Return meat to skillet; stir in barbecue sauce. Spoon meat mixture into 2-qt. casserole sprayed with cooking spray; top with vegetables, cheese and stuffing. Save 50 calories and 6g of fat, including 3g of sat fat, per serving by preparing with extra-lean ground beef or ground turkey breast, and KRAFT 2% Milk Shredded Cheddar Cheese.